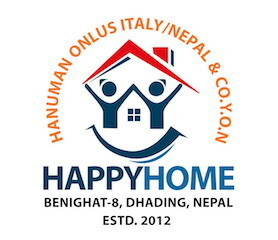 " Happy Home " is the family home of Hanuman Onlus in Nepal born after several years of planning and fundraising for its realization. On October 8 , 2012, our volunteers have celebrated the inauguration Benighat , the village in which it stands, place about three hours' drive west of the capital , Kathmandu. In a cozy and comfortable, Hanuman Onlus houses abandoned children and orphans with no family , some of which are already followed in the design of long-distance support "Happy Child" . The structure consists of a large kitchen, several bedrooms , multiple bathrooms with hot water available throughout the year, a large library after school care , recreation area for entertainment and an area for volunteers. At full capacity can accommodate up to 60 children . The inclusion of the first children in their new " Happy Home ," began in January 2013, when some volunteers Hanuman Onlus , went specially in Nepal , to organize the structure in all the practical details , including the commitment to establish rules of good management and the joy of children , due to their ease approaching that were not accustomed to.